Get a Comprehensive Set of Step-by-Step Worksheets for Preschool, and Give Your Child A Head start! Hi, I'm Liz Allan, creator of The David Dolphin Workbooks. I developed these preschool worksheets over the three decades I have been teaching preschool children, using tried and tested methods that are updated regularly, to give children the skills they need for junior school. I have personally seen the results that my worksheets help children achieve, and I know that your child will benefit from them too. I run a successful preschool that consistently produces children who are well-prepared for primary and secondary education. My preschool children go on to achieve excellence in academics as well as extra-curricular activities in junior and high school. Over the years I have seen my learners develop into successful young adults. My past pupils have gone on to become doctors, veterinarians, accountants and successful business owners, and I am proud of each and every one of them. A testament to my success is that many of those learners return years later as mothers seeking to enroll their children in my preschool. At this rate I may never be allowed to retire! I have a simple philosophy – a confident child will be a successful child. The David Dolphin Worksheets for Preschool will help your child enter kindergarten and school with confidence, knowing that they can cope with the work, and able to take on new challenges and succeed. If your child starts school with confidence, they will cope with the new environment far better than if they feel insecure and anxious, unable to keep up with their peers. These preschool worksheets will equip your child with the skills they need for school, with a thorough understanding of basic concepts in all learning areas. They've worked for me for 30 years - now it's your turn. Liz Allan - Author of The David Dolphin Workbook series. "My son Blair had an exceptional start in his primary and higher education which I soundly believe was due to his preschool grounding with Liz Allan's workbooks. He has now applied at university to become a veterinary surgeon and has been accepted." "The author of the pre-school books has been a positive influence in the lives of numerous individuals known to me. She taught my brother, my cousins children and my own son. The children in her care seem to learn various skills, such as mathematics, spelling, reading, fine and gross motor control, and general knowledge, to name a few, at a very fast rate. The author is able to assist young children in conceptualising and integrating themes and ideas vital for later school success. 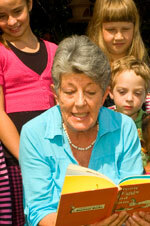 She has a way of making learning a fun experience for young children. Her vast experience and in-depth knowledge of the development of young children and teaching techniques is evident in the success of the children in her care over many years. I would not hesitate to recommend her as a pre-school teacher, as well as support any educational material that she creates." "I arrived at Liz's pre-school when I was only 3 years old, now being a 20 year old Student Athlete studying at Wright State University in Dayton Ohio on a full scholarship, I have to attribute my success to this fantastic lady. Not only did her workbooks provide the foundation for my education but also sculpted the person I am today both in my morals and beliefs. Her constant motivation pushed me to higher levels in my sport( represented South Africa internationally in swimming). I strongly believe that I would not be in my current position in life if it were not for me having the privilege of being mentored by this remarkable person." "Travelling for 40 kilometres every day for 8 years for my children to be with Liz was well worth the effort. Both my children have excelled in academics with awards in primary school, thanks mainly to the tuition Liz provided with her comprehensive worksheets. Without their excellent start with Liz, I am sure I would not be the proud mother of such clever, happy and successful children today." Copyright © worksheetsforpreschool.com. All Rights Reserved.